Rapid, but often uncertain increases in population, together with escalating pressure on natural resources, existing infrastructure and rising costs are challenging the ‘sustainable’ growth and survival of Australian regional towns. Growing towns, in particular many in Western Australia supported by mining economies, are facing limited water supply, high energy demands, increased waste generation and ecosystem degradation. In addition, they are often constrained by aging and inadequate conventional infrastructure, typically based on centralised water and wastewater systems and non-renewable energy sources. Given the significant growth occurring in many regional Australian towns a new approach is needed to address infrastructure provision in a sustainable manner, across environmental, social and economic as well as governance dimensions. 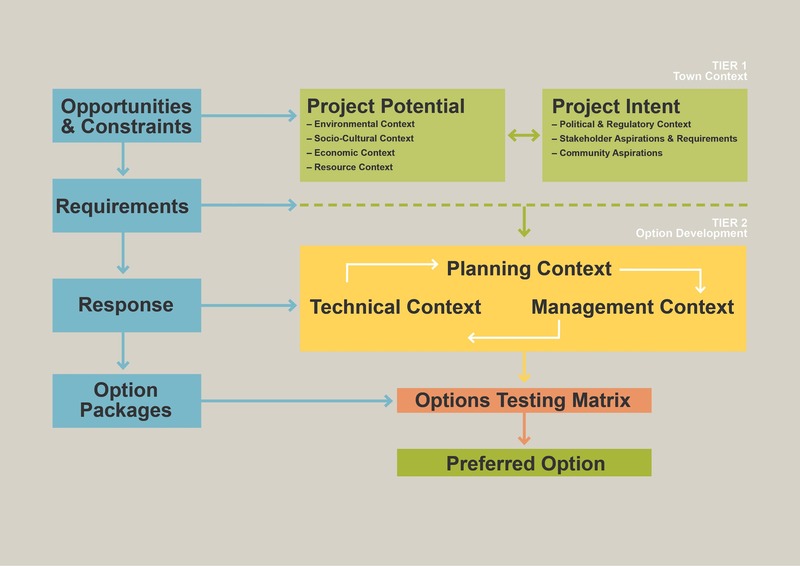 To address this, we developed an innovative planning framework (Integrated Sustainable Development Framework, ISD) and multi-criteria decision tool (Sustainable Infrastructure Decision Model, SIDM©), and applied this to a rapidly growing southwest WA township – Hopetoun. Key to the approach is the use of local context analysis as a driver to the generation of solutions, along with equal consideration of stakeholder intent, capacity and commitment, so that the provision of services is optimised to the particular site (i.e. town). This tool and design approach successfully led to a decentralised solution for Hopetoun approximately half of the cost of the conventional solution, with considerable water and energy savings. Since then, the ISD/SIDM tool was adopted as a preferred decision tool by key government stakeholders. Since then, the tool has been successfully applied to many other regional towns as well as urban infill developments and subdivisions. @ SYRINX ENVIRONMENTAL, est. 2000.